[Transferred] Ælfheah, officially remembered by the name Alphege within some churches, and also called Elphege, Alfege, or Godwine, was an Anglo-Saxon Bishop of Winchester, later Archbishop of Canterbury. 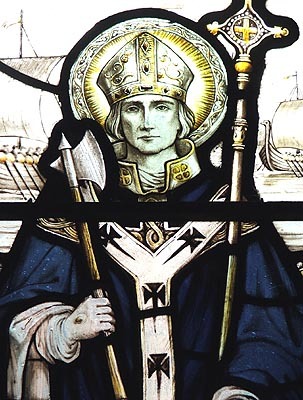 Archbishop and “the First Martyr of Canterbury.” He was born in 953 and became a monk in the Deerhurst Monastery in Gloucester, England, asking after a few years to become a hermit. He received permission for this vocation and retired to a small hut near Somerset, England. In 984 Alphege assumed the role of abbot of the abbey of Bath, founded by St. Dunstan and by his own efforts. Many of his disciples from Somerset joined him at Bath. In that same year, Alphege succeeded Ethelwold as bishop of Winchester. He served there for two decades, famed for his care of the poor and for his own austere life. King Aethelred the Unready used his abilities in 994, sending him to mediate with invading Danes. The Danish chieftain Anlaf converted to Christianity as a result of his meetings with Alphege, although he and the other chief, Swein, demanded tribute from the Anglo-Saxons of the region. Anlaf vowed never to lead his troops against Britain again. In 1005 Alphege became the successor to Aleric as the archbishop of Canterbury, receiving the pallium in Rome from Pope John XVIII. He returned to England in time to be captured by the Danes pillaging the southern regions. The Danes besieged Canterbury and took Alphege captive. The ransom for his release was about three thousand pounds and went unpaid. Alphege refused to give the Danes that much, an act which infuriated them. He was hit with an ax and then beaten to death. Revered as a martyr, Alphege’s remains were placed in St. Paul’s Church in London. The body, moved to Canterbury in 1023, was discovered to be incorrupt in 1105. Relics of St. Alphege are also in Bath, Glastonbury, Ramsey, Reading, Durham, Yorkminster and in Westminster Abbey. His emblem is an ax, and he is depicted in his pontifical vestments or as a shepherd defending his flock. God who didst adorn thy loyal confessor blessed Elphege with the dignity of priesthood and the palm of martyrdom, grant us this book, that with his aid in pleading our cause before thee, we may be enabled to rejoice with him in everlasting bless. Through Jesus Christ our Lord, Who liveth and reigneth with Thee in the unity of the Holy Ghost, one God Forever and ever. R.Amen. Then the righteous will stand with great confidence in the presence of those who have oppressed them and those who make light of their labours. When the unrighteous* see them, they will be shaken with dreadful fear, and they will be amazed at the unexpected salvation of the righteous. They will speak to one another in repentance, and in anguish of spirit they will groan, and say, ‘These are persons whom we once held in derision and made a byword of reproach – fools that we were! We thought that their lives were madness and that their end was without honour. Why have they been numbered among the children of God? And why is their lot among the saints? Alleluia, alleluia. V. Ps. 88:6 The heavens, Lord, are witness of thy wonderful power, of thy faithfulness before the court of the holy ones. Alleluia. V. Lord, thou hast set a jewelled crown upon his head. Alleluia. The heavens, Lord, are witnesses of thy wonderful power, of thy faithfulfulness before the court of the holy ones alleluia, alleluia, alleluia. Lord, bless and receive these gifts we have laid upon thy altar; so at the intercession of thy blessed martyr bishop Elphege they may bring us the fruit of salvation in this world and in the next. Through our Lord Jesus Christ Thy Son our Lord, Who liveth and reigneth with Thee in the unity of the Holy Ghost, one God Forever and ever. R. Amen. The good man will rejoice and put his trust in the Lord; the upright heart will not boast in vain alleluia, alleluia. We who have received thy sacrament implore thy mercy, Lord, and pray that through the intercession of thy blessed martyr bishop Elphege what we achieve at this moment maybe our possession for all eternity. Through Our Lord Jesus Christ, Thy Son, Who liveth and reigneth with Thee in the unity of the Holy Ghost, one God For ever and ever. R. Amen.